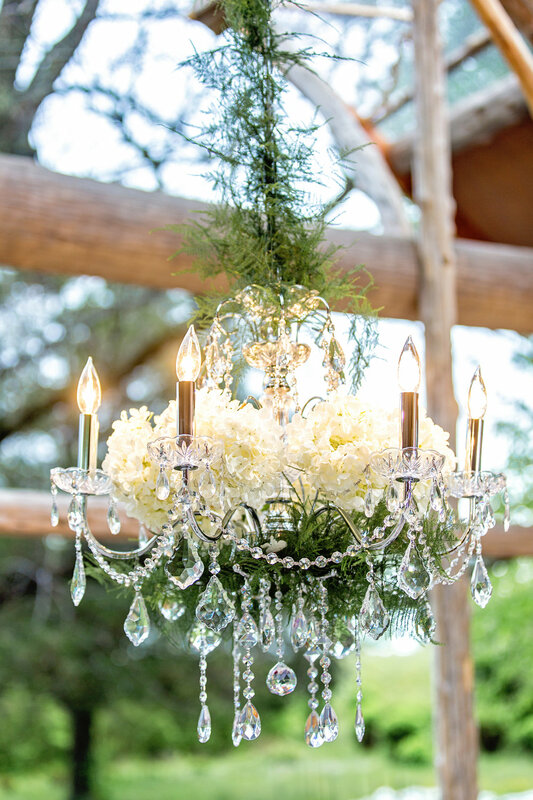 This styled shoot had the same challenge that many outdoor weddings have--the threat of rain. Reschedule...no way! The design team moved forward. 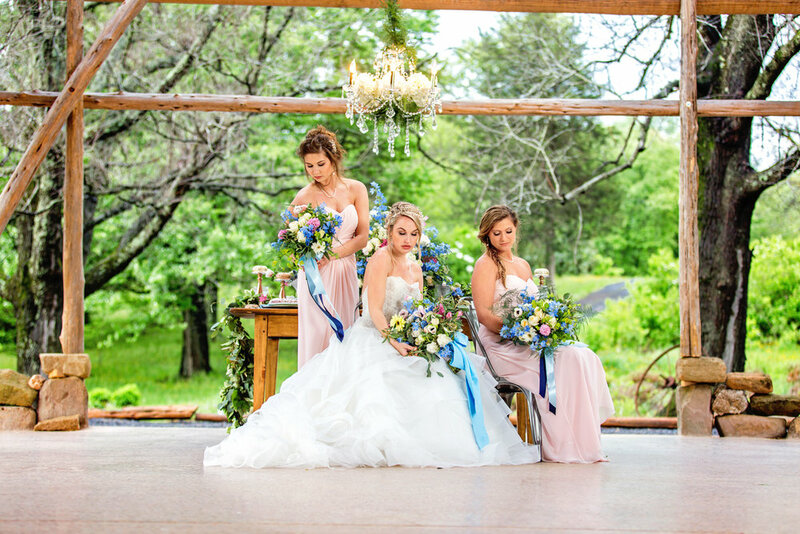 With a pavilion, rain boots and umbrellas this styled shoot was brought together in breathtaking rose quartz and serenity. These colors shine in this enchanting garden. The head table was a mix of feminine and masculine, vintage and modern with place settings fit for a stunning rustic outdoor wedding. 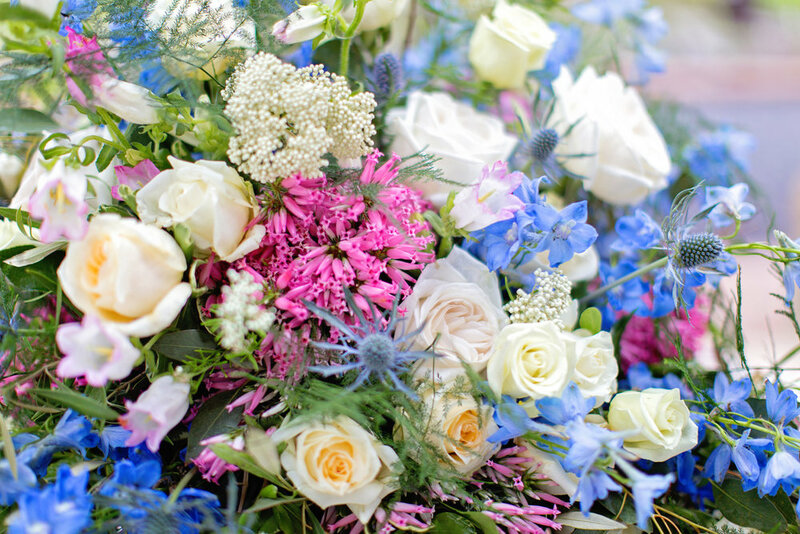 The centerpiece displayed flowers in various shades of pink, blue and buttery yellow. 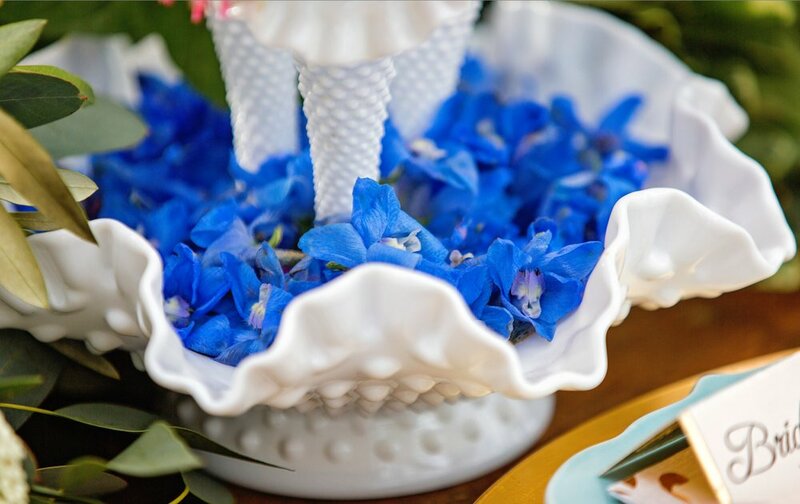 The depth of visual texture and movement was accomplished by adding many unique stems, such as the blue Eryngium (thistle) with the white O'Hara garden roses and delicate blue Volkerfreid Delphinium. A bit of whimsy played nicely with the petite tubular blooms in the Italian heather and small pearl clusters of white rice flower. The cake has been suspended in air and displayed beautifully surrounded by gold geode lanterns. 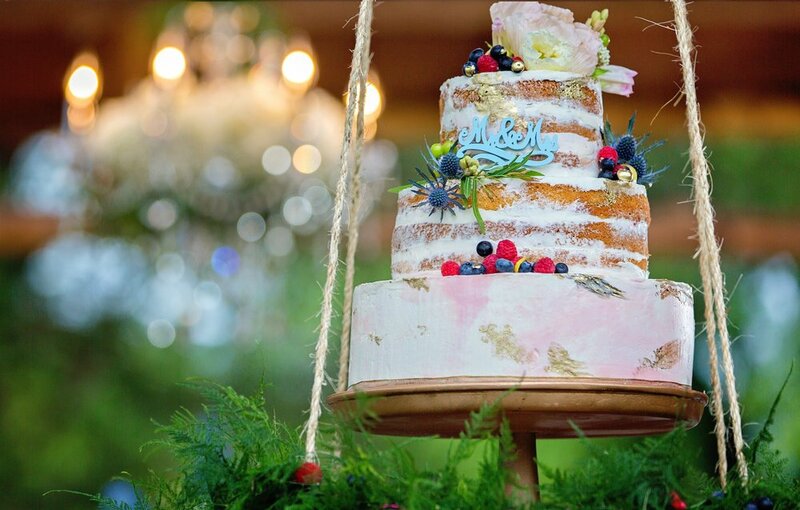 The cake is adorned by white Icelandic poppies, blueberries, raspberries, thistle and brushed with gold. 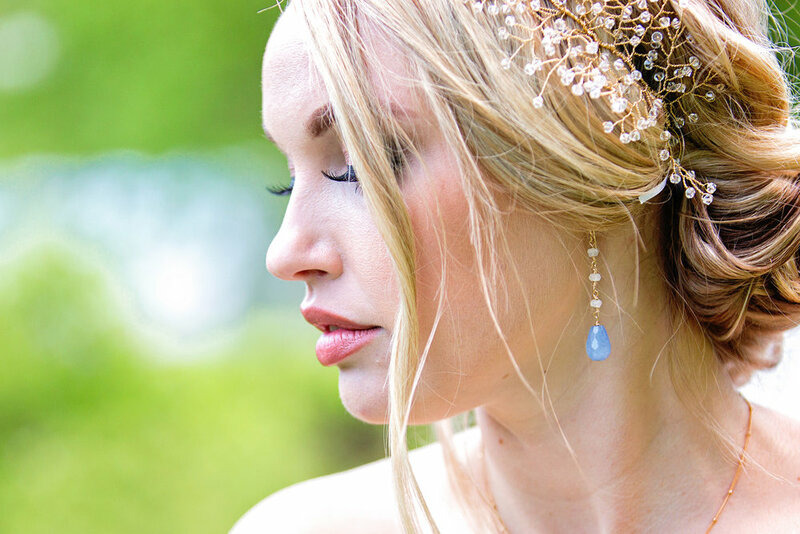 The beautiful crystal headpiece was inspired by soft baby's breath. 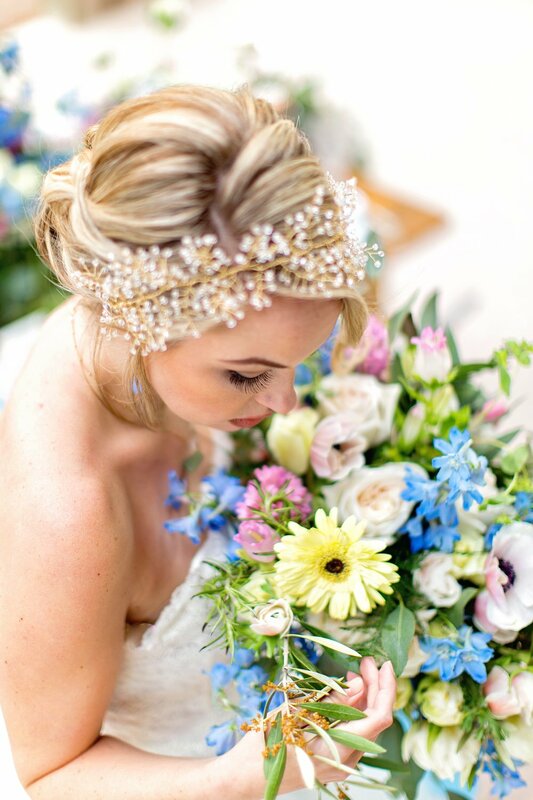 This gorgeous bridal piece is custom made of 500 Swarovski crystals that have been meticulously hand wrapped to perfection. The soft creamy brushed gold stationary is an invitation dipped in elegance. The menus and place cards brought an added element of sophistication to the table that did not go unnoticed. So if it's raining on the big day...bring your smile because your pictures will be stunning! Rain creates perfect reflections that will turn ordinary photos into extraordinary. Colors in the rain are more saturated and vibrant making gorgeous photos 'happen'. So relax, bring an umbrella along with your awesome sense of adventure and take advantage of the beauty rain offers. Enjoy this day because you are a beautiful bride--come rain or shine.